It's a sunny 26F January afternoon. Not warm by any stretch of the word (because it is the middle of winter, after all), but that sun just feels too good. White pine branches shed clumps of snow from the last storm. Piles of ice line the river, with bubbling, open water in the center. Tiny flies emerge from the water and warm themselves on sunny drifts. Trout are hungry. When I tell my coworkers about winter weekend plans to go fishing, I field questions about ice houses and walleyes and personal preferences between gas augers and hand augers. This isn't that type of fishing. Yes, beer is still involved, but the method and target species are different. While many rivers in Minnesota do ice over during the winter months, trout rivers, usually have faster water, which require colder temperatures to freeze. Winter fly fishing is similar to summer fly fishing, with a few key differences. The first is the type of flies that are used. Midges are the only bugs that hatch this time of year, though you rarely see trout rising to feed on the surface. This means wet flies--tiny lures fished below the surface, meant to mimic insects before they grow wings--work best to hook into fish. Cold temperatures make fish sluggish, so they spend most of their time where the current is slow, requiring less energy to swim. You'll find schools of trout residing in deeper emerald pools, hanging near the bottom, and waiting for food to drift into their mouths. Another difference of winter fly fishing is that the water is usually warmer than the air temperature. The air temp is 26F, but the water is hovering above 32F at its coldest. Waders are absolutely required to keep you dry when you're knee-deep casting into a pool. Don't get me wrong, your feet will still go numb if you are in the river for too long even if you do have the proper gear, but waders allow you to do it by fending off that pesky hypothermia. Note: whiskey also helps and is recommended. Oh, and if the air temperature is colder than 36F, the guides on your rod will freeze. So that part's fun. Most winter days of fly fishing start later than spring or summer days because the heat of the sun makes the bugs (and trout) more active. Wake up by 9am and relax around the house, leave by 10am, pick up coffee and donuts on the way to the river, start fishing by 11am, spend a couple hours on the water, break for warm lunch and a beer, then fish until the sun starts to drop at 4pm. It's a tradition among my friends to stop for beers and cheeseburgers on the way home. We need winter fly fishing because it forces us to slow down. Intense bug hatches during the summer make the water seemingly boil, and you rush from pool to pool — almost racing other fishermen, sometimes catching a fish every cast. Winter is different. The sun sits lower in the sky; ice crinkles as it freezes on river banks; you see bootprints in the snow, but no people; piles of snow melt drip by drip during the heat of the day; nuthatches chip away at riverside oak trees, and trout can't be bothered for a meal. It's during this time of year that we are afforded a chance to soak in our surroundings and admire the beauty of a frozen landscape. 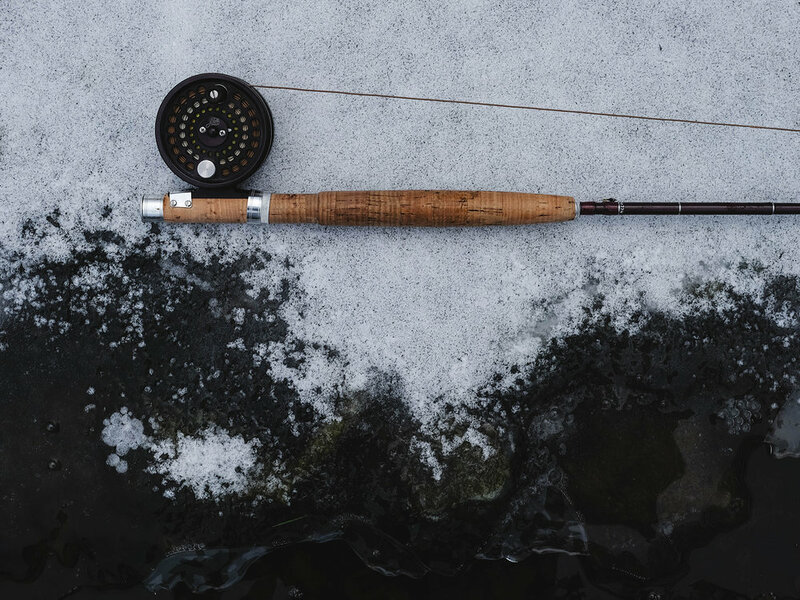 Though the cold can make it hard to feel your fingers well enough to tie knots in your line, your soul is warm from time spent connecting with the natural world we love so much.